A rural Alberta county has undertaken innovative measures to maintain health care services close to home. Thorhild County, located about 80 km north of Edmonton, has stepped up to open the doors of a local clinic, and have hired a Nurse Practitioner (NP) to ensure medical services are available to local residents. In December, County Councillors received word that the doctor who had been coming to Thorhild would soon require his patients to begin travelling 40 minutes to Smoky Lake for appointments. This was potentially a big blow for the hamlet of Thorhild, and the 3200 residents who reside in the community and the surrounding rural County. “If you lose your medical coverage in your community, that’s about the surest way to kill your community,” said Wayne Franklin, Thorhild County CAO. Recognizing that not all residents had access to transportation, a meeting was held on Jan.5 with various stakeholders to discuss their options. A month later, County Council passed a motion directing administration to begin the process of setting up a clinic, and hiring a Nurse Practitioner. As a result, a medical centre with two examining rooms and a waiting area was opened in the back area of the County building on April 10 – a turnaround time that Franklin acknowledges was akin to “turning things on a dime”. “It’s one thing to think outside of the box, but when you do that sometimes you have to step outside of the box and find a way to make it happen,” said Kevin Grumetza, Reeve for Thorhild County. County staff had to overcome many challenges when trying to open the clinic. An absence of health care expertise on staff meant county employees had to figure out how to find suppliers, navigate paperwork, and secure a Netcare FOB, which enables the user to access the provincial electronic health record system. “As every problem cropped up, we found a solution to it,” Franklin said. The Nurse Practitioner hired was Colleen Cartier, who came with 13 years of experience as an Registered Nurse, before returning to school to become an NP. Among the services offered by Cartier include diagnoses and treatment of a wide variety of illnesses and injuries; ordering and interpreting lab and diagnostic testing; prescribing or adjusting medications as needed; performing minor treatments such as suturing; women’s health assessments; chronic disease management; and referrals to specialists or local doctors. Cartier has been very well received in the community. New mom Jessica Olchowy brought her one-month-old son, Tucker, to the Thorhild County Family Medical Clinic for a well check with Nurse Practitioner Colleen Cartier (not pictured). 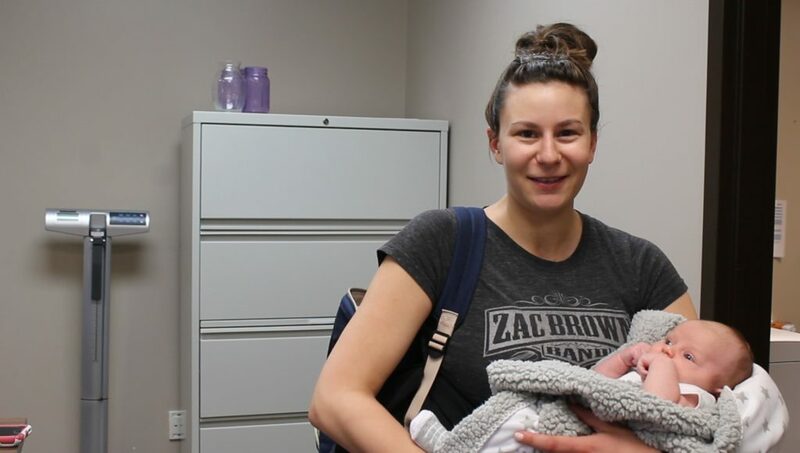 “Colleen has been really great so far,” said Jessica Olchowy, who brought her one-month-old son, Tucker, in for a well check, adding she would definitely be sending family members to the clinic. Paul Campbell, who lives at the Thorhild Lodge where Cartier makes visits once per week, says he was pleasantly surprised when he discovered what services Cartier could provide. “I’m unfamiliar with Nurse Practitioners,” he said, but added Cartier has given him a prescription for his bad knee, and he enjoys walking to the clinic rather than waiting for a doctor’s appointment. Helen Schreyer, another resident at the Lodge, sees Cartier in-house and has appreciated the care. “The biggest goal for this clinic is for the community to be aware of what it is, and for people to actually utilize it,” said Carolyn Sedlowsky, FCSS Manager with the County. Cartier, who is a County employee, and is paid by salary rather than on a per-patient basis, said the flexibility of an independent practice gives her the ability to spend the time she needs with each patient. “It’s an amazing opportunity for a Nurse Practitioner to be able to take part in something like this,” Cartier said. The clinic is open weekdays, and while appointments are encouraged, walk-ins are welcomed. Future goals for Council include expanding the medical centre to include various health professionals, and area doctors are invited to make use of the clinic as needed.